If you look at nations like Brazil, China, India, and others in Africa, you will find tens of thousands of individuals turning to faith in Jesus Christ every day. Revival is happening now! 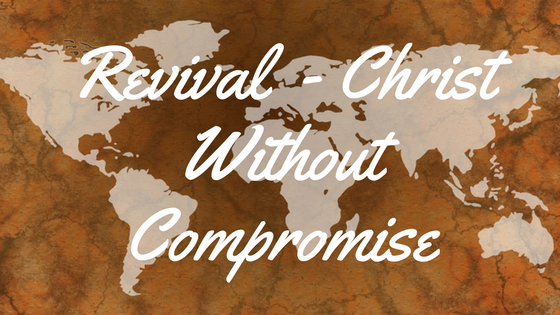 People are professing faith in Christ without compromise! Is this a picture of the North American church? There are pockets of faith in Canada and the United States where God is moving profoundly. Generally speaking however, we have a faith of compromise. Because of our efforts to create a path between of least friction with current culture, in many areas where we have lower standards than God has established through his Word. Do you not know that friendship with the world is enmity with God? The word “people” is not a singular word, but a corporate word referring “not to individuals, but to the churches“. Is it impossible for a corporate body of believers to shake hands in agreement with the world’s ethics and remain in the place of blessing and favour with God? In attempting to make the gospel more palatable in current North American environment, we indeed have “blended” even very opposite moral and ethical values, compromising godly standards at multiple levels. As a christian community we have become diluted. In Ontario over 1000 cancer patients were given watered down doses of chemotherapy. The law suite was in the millions. Scandals about businesses providing low quality products for high quality prices abound. The courts rule, “Intolerable!” Society agrees! The Word of God, the Bible, forms the foundation of our faith. The spiritual sickness in humanity is much more powerful than any cancer. We owe it to all, to offer the undiluted truth. It is interesting to note, where the gospel is flourishing is in the very nations of the world where it is clearly taught: Christ alone – the Word plus nothing. Traditional faith stands strong when it stands on its own! Within the people groups where being a Christian means Christ plus ______ (fill in the blank) there is marked decline in effectiveness and growth. I have shared pieces of my journey before. Only when I confessed Christ as Lord, could transformation begin to occur in my life. I continue in this process of surrender and yielding to Him. The more Christ reigns in a single life, the more one is able to walk in the undiluted power of Holy Spirit control and effectiveness. Revival begins individually and spreads corporately, sometimes nationally. Many prophetic voices agree with the Bible in affirming a coming world-wide revival like Christianity has not experienced to this point. We are seeing it happen in many nations. My prayer is that North America will be included. Jesus is coming again! He is coming for a powerful and beautiful church! is out of your reach. the fullness of your salvation. A Refreshing Stream – A Good Rain is Coming!